As an intro, I would just like to introduce what "Food Bits" posts will be. I will try to introduce one crab-safe food every week and break it down: where it comes from, nutritional facts, and how to serve it to the crabs. You can trial the foods at home with your hermits and comment on how the crabs liked each food! 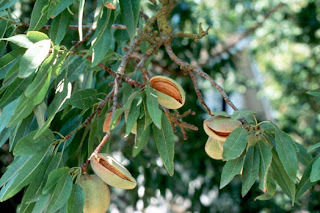 Almonds come from a tree native to the Middle East. There, they are found inside of the harder, inedible outer hull. The inside is the true nut, while the entire fruit is known as a drupe. Once the outer hull is removed, the inside may be eaten. Some popular methods are to eat them raw or roasted, and usually with salt. Nutritionally, almonds are particularly high in protein, fats, and vitamin E. These foods are an excellent source of plant-based protein for your land hermit crabs, but be sure to substitute in meat-based proteins such as fish and poultry, too. The proteins from the almond are good for land hermit crabs. They make up 61% of a human's daily value when 145 g are consumed, making them a high-protein food. Almonds are also a great source of Vitamin E, scoring over 100% of a human's daily value when 145 g are consumed. Besides being high in protein and Vitamin E, it is also a good source of magnesium and manganese. The type of almonds that should be served to land hermit crabs are raw, unroasted/unsalted almonds. These can be found, usually, in any grocery store, but they are expensive. However, if you're planning on using them for the crabs only, they will last over one year. The crabs will also be able to eat roasted/unsalted almonds. Salted almonds are never a good choice for land hermit crabs. 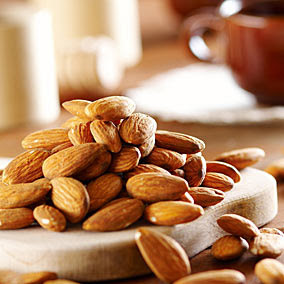 To serve the almonds, you can slice them in thin slivers using a sharp knife or grater. You can also use a food processor to powder or puree the almonds with a little spring water or organic fruit juice. I have given my crabs almonds in the following methods: slivers, grated into a powder, and puréed with organic apple juice. The crabs loved the slivers! So, try almonds! They go great in a crabby fruit salad or served as purée. The purée opens up a big possibility because you could add in calcium through cuttlebone powder and you could throw in some fruits to make a very healthy smoothie! *Nutritional data collected from Nutrition Data. After posting this and having a few bags of raw, unroasted almonds in the cabinet (my family LOVES them), I decided to cut up some for my hermits tonight. Let me tell you - they LOVED them. My smallest E, Santino, managed to drag an almond slice all the way to the top of a very high decoration. I have no idea how he managed to climb so high while holding onto his almond, but it really goes to show his personality! I hope your herms will enjoy almonds as much as mine have!